Higher-density “smart growth” neighborhoods located in the right places could delay by decades an expensive plan to pump water to El Paso from other parts of Texas, the city’s top water official said Wednesday. “It’s not a matter of water supply; it’s a matter of infrastructure,” Ed Archuleta, El Paso Water Utilities president and chief executive officer, told members of the Public Service Board at their Wednesday meeting. It’s easy to be confused by the economic terms bandied about, particularly “growth” and “development” – but wonder no more. These words and others will be explained at an event starting Thursday, June 16 at the Chelmsford Senior Center. The economic development consultant Smart Growth America will hold a presentation on sustainable growth practices, especially as suggested in the Chelmsford Master Plan, from 7 to 9 p.m. A full-day workshop will take place the following Friday. On Wednesday morning, Trumka told a closed meeting of the Chamber’s board that the country needs to rebuild its crumbling infrastructure. The push for more spending on roads, bridges and highways has become a common cause this year for the labor federation and the business group. Trumka and Tom Donohue, the Chamber’s president and CEO, have made several joint appearances together, including testifying together before Congress. On June 2, around 75 people attended Smart Growth vs. Urban Sprawl, an event at Temple Emanuel designed to highlight both the negative aspects of sprawl and a number of alternatives through video, guest speakers and song. Joines and Bennett were two of the guest speakers, along with Rabbi Mark Strauss-Cohn of the temple, Russ Dubois of the Creative Corridors Coalition and Judy Hunt, one of the city’s principal planners. Detroit business owner: "It is almost impossible to recruit to Michigan"
I noted sadly the other day that the entire Oakland Country government complex was built in a field five miles outside of downtown Pontiac. I find that decision shocking. What a wasted opportunity for maintaining a viable downtown Pontiac, not to mention the open space now consumed by the existing complex. 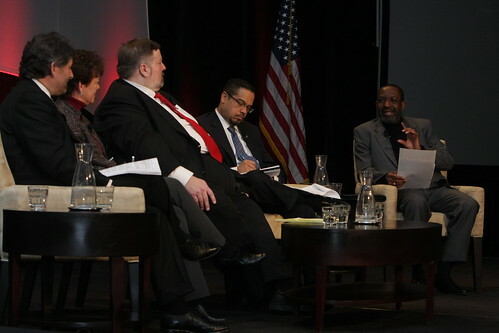 The annual Good Jobs, Green Jobs National Conference is wrapping up today in Washington, DC. Coordinated by the BlueGreen Alliance Foundation, the multi-day conference shares ideas and strategies for building a green economy that creates good jobs and preserves America’s economic and environmental security. It brought together a diverse group of agencies and organizations to tackle questions about revitalizing our economy, replacing jobs lost in the “great recession” and building the infrastructure needed to keep America competitive in the 21st century. Congressman Keith Ellison discussed how sustainable communities have the ability to increase independence, maximize efficiency and encourage innovation. Clark Manus, President of the American Institute of Architects (AIA), detailed how AIA is “working with communities on more than just buildings,” and emphasized the possible depth of what “more sustainable, more responsible communities” can offer their residents – from increased access to transportation options to a stronger economy.